Surao Ban Don Community was settled in Bangkok more than 200 years ago. The community is situated on the banks of the Saensaeb Canal. The economic development of Bangkok under the concept of capitalism, which can be found in the construction of Phetchaburi Road and Sukhumvit Road, led to a drastic change in the size of the population, population diversity and community disorder. Saensaeb Canal acted as the last stronghold to protect the community from external threat. This study suggests that community sustainability cannot rely solely on physical advantages. Social mechanisms as measured in terms of three components, namely, a value system, economic capital and human resources, are the key factors for community solidarity. In addition, it is suggested that although a community is strengthened, each community cannot exist in the form of a closed society. The process of co-management should be channeled from the individual level, community organizations or groups within the community up to network building outside the community. Cooperation among households, schools and temples or mosques are the key success factors in strengthening public participation. Strategies in terms of top-down management should be reformed to bottom-up management. There is no specif ic model for co-management. Co-management varies with the unique conditions and characteristics of each area. The same basic “blue print” cannot be drawn. Joining in any community activities should be restructured from cooperation to participation. Participation means thinking, planning and working together. Community participation is a signif icant social mechanism for sustainable development. This research article aims to explore and study the history of the emergence of Buddhist monasteries and Muslim mosques established along Saensaeb Canal in Bangkok. As well, the contributing factors in the continuation of the co-existence of these religious sacred places for worship and ceremony during the Rattanakosin period has been explored using historical research methodology and a physical survey. The research finds that the history of the emergence of monasteries and mosques began in the Thonburi period with the establishment of Saensaeb Temple (or Saen Suk Temple) in the area of the Saensaeb rice f ield, and then the Bankrua Mosque was erected (or Jamiulkhoyriyah Musjid) during the reign of King Rama I of the Rattanakosin period. From the reign of King Rama III onwards, after digging the Saensaeb Canal as a channel for transportation, many monasteries and mosques have been constructed until the present reign. There are a total of 36 religious places along the canal, 11 are community Buddhist monasteries and 25 are Muslim mosques. A number of factors have contributed to the emergence and continuation of peaceful relations between those monasteries and mosques, such as historical and socio-cultural factors that have existed since the construction of Saensaeb Canal; social harmony between Thai and Muslim people in the community; religious commitment of residents; and the relationship of artistic interest and spiritual direction between monasteries and mosques in the Rattanakosin period. An environment that fosters social relationships of both religious and cultural groups is ref lected in the model of peaceful and harmonious interaction between people of different religious and spiritual beliefs in this Bangkok community. The concept of Intangible Cultural Heritage (ICH) is derived from UNESCO’s Convention for the Safeguarding of the Intangible Cultural Heritage 2003, which emphasizes the identity and diversity of the culture of a community by encouraging consciousness in safeguarding their own cultural heritage. The transmission of ICH is a part of the preservation of ICH consisting of two kinds of holders: traditional knowledge holders and community culture holders. This article focuses on the role of traditional knowledge holders, which are the core of the process of ICH’s transmission. Such roles are those of the three case studies: an artist, a Buddhist monk and an ancestral spirit medium. The research shows that both kinds of knowledge holders share a common characteristic – they are willing to preserve and hold the knowledge directly, as well as transmit such knowledge to the next generation. The holders are special people; their acquisition of knowledge is not easy and takes a long period in transmission. However, it was also discovered that each of the two types of holders have some difference with each other. The difference concerns the aspects of knowledge transmission and the creativity of an artful holder who is free to express their individuality, but can only be created in the frame of old tradition. The holder who possesses knowledge on rites and ceremonies has little or no creativity because they have to adhere strictly to tradition and custom. Although the knowledge holder has a crucial role in transmitting knowledge, they are not the owner of such knowledge because there is no legal right. Thus, they are always regarded as traditional knowledge holders. This research aims to study the knowledge of the recitation and intoned conversation of Nang Yai (Large Shadow Puppet). The researcher interviewed Master Vira Mimuean who conserves and transmits the recitationintoned conversation style of Nang Yai from Master M.R. Charoonsawat Suksawat of Phraya Natthakanurak (Thongdee Suvarnaparata)’s school. At present, Master Vira Mimuean is the only one who has kept the traditional voice and Nang Yai recitation. From the research, The researcher discovered that the knowledge of recitation-intoned conversation is composed of the practicice of recitationintoned conversation of Nang Yai, Kratoo and Loy dok conversation. There are eight steps in the recitation and intoned conversation which are Recognizing the prosody, Word compresses, Voice compresses, Dividing syllables, Using neck, Compounding conversation, Recognizing melodies, Recognizing intonations. The research focuses on the importance of the recitation and intoned conversation of Nang Yai in terms of the intellectual cultural heritage of the nation. 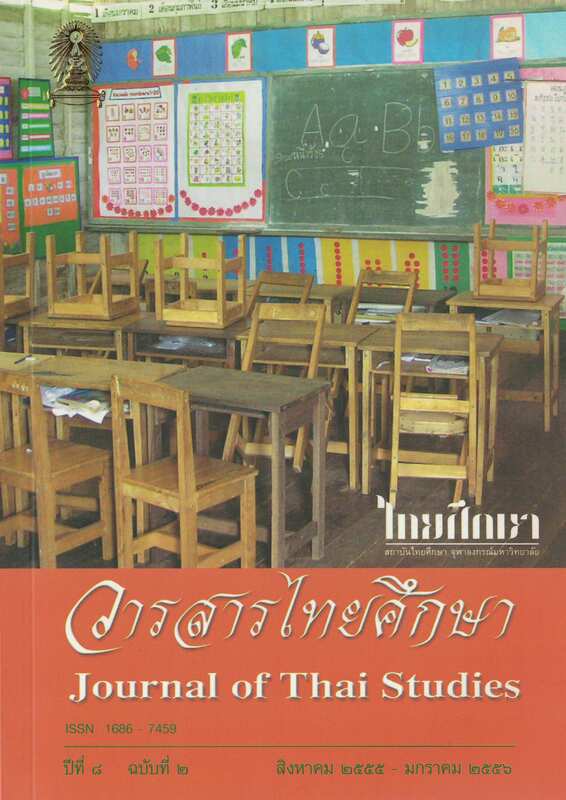 This article aims to study Ka Phueak literature in order to compile the original Ka Phueak palm leaf manuscripts in the Thai Yuan community, Amphoe Sao Hai, Changwat Saraburi. The research reveals that the villagers aged over 60 years old are accustomed to the story and participate in the Ka Phueak chanting ceremony. Six copies of the manuscripts have been discovered in various Thai Yuan temples in the community. The ultimate aim of this research is to preserve the living tradition of Ka Phueak literature and Ka Phueak chanting ceremony in the Thai Yuan community and encourage the Thai Yuan community, especially the new generation, to realize and take part in the wisdom legacy of their ancestors. Phi Sa Oeng are the family lineage ancestral spirits of the Kui at Ban La-o, Amphoe Namkliang, Changwat Sisaket. Their duty is to protect and take care of their descendants. If their descendants break the custom, the spirits can cause them illness. Annually, during the third and sixth month, villagers will arrange the ancestral spirit worship in order to fulf ill their vows, thank and worship the spirits. This worship helps transmit the belief in ancestral spirits. At the same time, the worship helps to transmit the customary law of the Kui at Ban La-o, teaches descendants and unites the relationship between the people in the community. In addition, the worship helps to build spirit for individuals and can respond to the spiritual needs of individuals and build the strength of the community. These are the reasons why the worship has been practiced for a long time until the present. This paper explores cross–border trade along the Thai–Laos border which is demarcated by the Mekong River and her tributaries. The paper covers the influence of the historical background of cross–border trade along the Mekong River; the significant of border trade to the lives of the people on the banks of the river; the role of the people along the banks of the river in the development of trade; and how the relationship of the people affects cross–border trade. Cross–border trade plays a crucial role in the lives of the people along the banks of the river. The Lao depend mostly on Thai consumer products to sustain their lives and the Thai depend on border trading to make their living. The historical background of the same race and the same nation is the most important contribution to the existing of cross–border trade along the Mekong River. The close relationship of the people as friends and relatives creates a collaboration of the people in setting up and developing the trade pattern which is consistent with their way of life. As a result, cross–border trade has become part of the culture of the people living on the banks of the Mekong River. พระพุทธปฏิมาวัดโพธิ์. กรุงเทพฯ: อมรินทร์พริ้นติ้ง แอนด์พับลิชชิ่ง 2555.